This spicy recipe for mussels from Peru may become your favorite way to prepare these tasty shellfish. 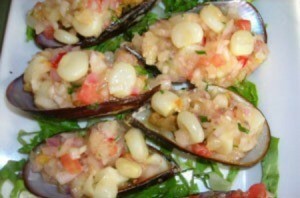 This page contains a Peruvian mussels recipe. This is my absolute favorite dish when we go to Peru! Of course there are many ways to prepare mussels, but Peruanos have a truly special (and tasty) one: the mussels are cooked a little and then they're served with a mix of lime juice, corn kernels, yellow chili/pepper, rocoto. This recipe is for 3 to 4 people. 12 fresh mussels - make sure they are closed! Clean the mussels. Wash and clean them with a brush. Cook the mussels in boiling water and remove them from the flame while they're getting opened - you don't want them to become overcooked. If some mussel don't open, remove them. Let them cool down. Open the mussels and put them in a dish. In a bowl, mix the onion, rocoto, tomato, parsley, kernels, lime juice, yellow chili/pepper, oil, salt and pepper. Let it sit for about five minutes. Pour approx one tablespoon from this mixture over each mussel, and serve with a piece of lime. I guarantee you, this will be the most amazing dish you ever tried - it has everything - sweet, crunchy, savory, salty. Life and cuisine just doesn't get any better! This sounds fantastic! Can't wait to try it. Thanks for sharing.